As the world becomes more and more digital, the popularity of booklets seems unchanged. Whether going to a play, or sitting in church, or attending a school awards program, booklets remain an important medium to connect with people. What do you do when you need to make a lot of booklets? Roll up your sleeves and get to work? Recruit a few friends to hopefully make quick work of it? 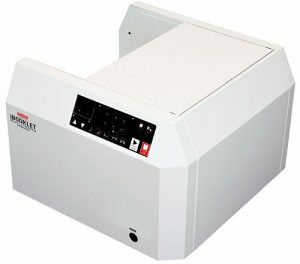 Or do you make an investment in your operation and get an automatic booklet maker? 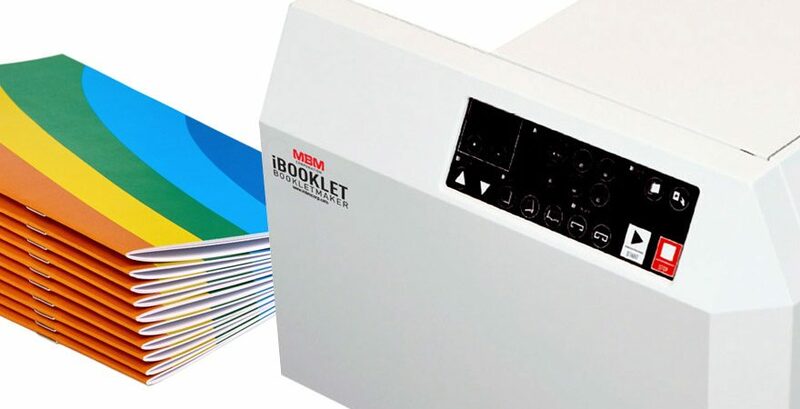 The iBooklet Booklet Maker from MBM Corporation may be just the tool you need to create professional looking booklets for your organization. The iBooklet Booklet Maker takes preprinted sheets and creates stapled and folded booklets in one easy step. Simply feed the prints in one end, and out pops a finished booklet from the other end. This tabletop model won’t take much space in your office or shop, but at up to 800 booklets an hour, it can add immeasurable capability to your operation. The icon-based control panel indicates the process, including any errors that might arise, like an empty staple magazine. And the LCD counter keeps track of the job progress and settings. The iBooklet works with a variety of paper sizes. Simply press the button that corresponds to the size you want to turn into a booklet, and the iBooklet automatically adjusts the stapling and folding position to accommodate. You can even feed non-standard paper sizes using the FREE button and setting the length. Feeding the unit is equally easy. Using the automatic setting, simply drop your paper packet into the iBooklet, and the machine detects the paper and gets to work. If you want finer control, use the manual mode. Once again, feed your packet in, but then press the START button when you’re ready. You create the booklets the way you want. Choose from 3 modes: staple only, fold only, or staple and fold. If you find yourself making a lot of booklets, perhaps it’s time to invest in an automatic booklet maker. There are many on the market that vary in size and capability. But the iBooklet from MBM just might be the perfect size for your organization. What will you do with all the time you save making booklets?